Thomas Taylor, PE is one of the most respected structural engineers in Texas and probably the United States. In practice for almost 60 years, he is a member of the Academy of Distinguished Alumni of the Civil, Architectural and Environmental Engineering Department at the University of Texas at Austin, and a Fellow of the American Society of Civil Engineers. 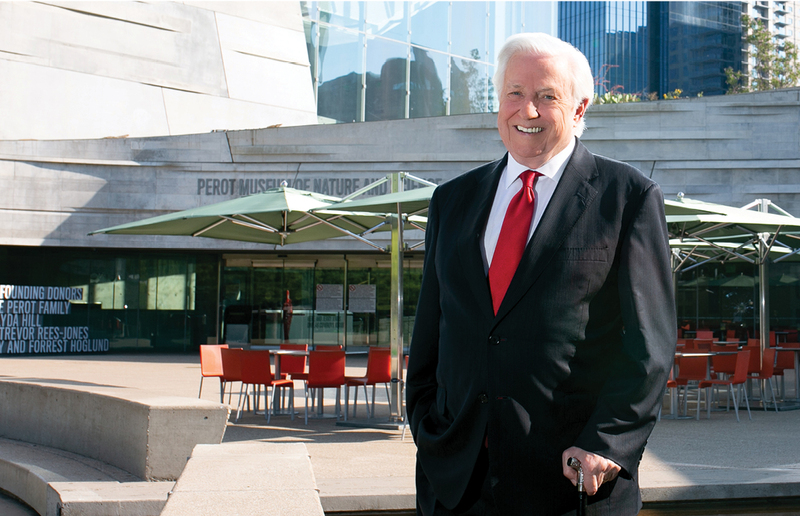 His many memberships include the Greater Dallas Planning Council, Thanks-Giving Square Foundation, and the Texas and National Societies of Professional Engineers. He is a former board member of DART and Preservation Dallas, serves on the advisory board of the Dallas Architecture Forum, and is an honorary member of AIA Dallas and the Texas Society of Architects. Additionally, AIA Dallas named him Consultant of the Year in 1997. As principal design engineer at Datum Engineers, Thomas brings outstanding quality to his architectural engineering projects, epitomizing the highest ideals of craft. I was honored to interview Thomas for this Columns profile. Tell us about where you grew up, your family, childhood interests, early jobs. I grew up in Houston, Texas, with my sister and a single, loving mom. My early childhood interests were playing solder during World War II and I also liked basketball. My first job was at age 6 collecting newspapers and coat hangers with a red wagon door to door for the war effort, but I was also paid a little. My mother would take me to the collection center every Saturday with a full load in her car. I lied about my age at 14 and got a summer job as a laborer working on construction of a church. I did this until college. During college, I worked building pipelines in 32 states and on a platform in the Gulf of Mexico. That money, along with waiting tables in the girls’ dorm, and money my sweet mother could send, paid my college expenses. It took me four years as a graduate engineer to equal what I made as a pipeliner. How did you select a major and what were your favorite areas of study? I went to the University of Texas in Austin primarily because it was a state school and tuition was $25 per semester. They had, even then, a spectacular engineering department. I did consider architecture. However, my aptitude was stronger in math, and architectural engineering was a better choice for me. I received a great education, paid mostly by the taxpayers of Texas. I haven’t forgotten how important this was to creating a great career for me and just recently donated the Datum Engineers Design Studio to the architectural engineering department as a way to say thank you to the university and the people of Texas. What influenced you to become an architectural engineer? My experience working construction since I was 14 years old led me to decide that I wanted to build buildings. I remember, as a young teenager working construction, sitting on a sawhorse caked with mud due to the humidity in Houston. My blue jeans were totally worn out from a summer of work; my hands were filthy. My mother had packed me a lunch, and I was sitting on the sawhorse eating my lunch. My dirty fingerprints were all over the white bread of my sandwich. I loved it. I thought I was in heaven. How did you start your career at Chappell & Associates, predecessor to Datum Engineers, here in Dallas? Times were tough when I got out of UT-Austin. Very few jobs were available. Engineers were going back to school to change majors and kill time. Mr. Chappell was a loyal Sigma Chi Fraternity alum and called me to come to work here in Dallas. Fortunately, all he cared about was that I was a Sigma Chi. My grades would not have gotten me the job. I took the job and love Mr. Chappell to this day. Both my son and my daughter are named after him. He designed the Cotton Bowl, 3525 Turtle Creek Apartments, Temple Emanu-El, and many other prestigious projects at the time. My first assignment was the design of the 1 million-square-foot Earle Cabell Federal Courthouse. How was the name Datum chosen for the firm when you became its CEO? The firm name was Chappell and Taylor, and Mr. Chappell had recently passed away. There were several staff members who deserved principal recognition, so I changed the firm name to Datum, datum being the starting point for which elevations and depths are measured in surveying. We had a graphic designer develop a new logo for Datum. I don’t remember his name, but our receptionist referred to him as a cross between Richard Burton and the Mad Hatter. Describe a few of the hallmark projects of the more than 40 on which you have been principal in charge or project manager. Many of my favorites are projects I did as a young engineer in the ’70s. Because technology was not what it is today, it made the challenge to achieve the structural engineering design even greater. Thanks-Giving Square, Citizens Bank in Richardson with 105-foot-long precast concrete spandrel beams, and the American Embassy in Geneva are three that I enjoyed. St. Ignatius Chapel at the University of Seattle, the arches at the Dallas Convention Center which Calatrava complimented, The Ballpark at Arlington, Federal Reserve Bank and EDS headquarters in Plano are also favorites. 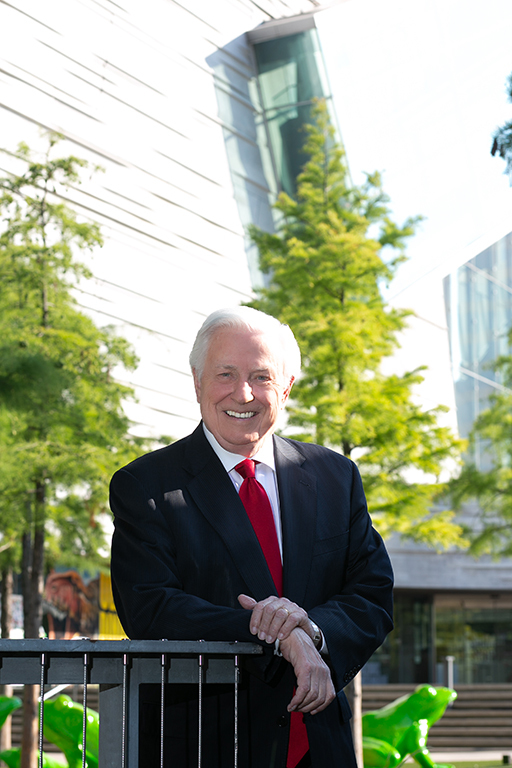 Recent projects I have done that are especially meaningful include the Perot Museum, the Irving Convention Center, and the new Parkland Memorial Hospital. My most sentimental project is the Dallas Police Memorial. You have worked with quite a few well-known architects. Tell us some about working with them. Philip Johnson, FAIA: He was the most dignified gentleman architect I met. He had a calm leadership style that allowed the team to accomplish his vision. Steven Holl, FAIA: Being such a high-profile architect, he amazed me with his flexibility to find fabulous solutions that could meet the budget. We started with stone walls on the St. Ignatius Chapel and wound up with the top AIA award for the year even though, for budget purposes, we ended up using concrete tilt-up walls, which at the time were considered a more industrial warehouse construction technique. Thom Mayne, FAIA: He was always a pleasure to be around. He may fall in the category of having the same type of architectural process as Philip Johnson. He worked a lot through his staff. Bud Oglesby, FAIA: He was my first client and was a wonderful man and architect. One of my proudest moments was when I was working with Bud to build a home for his wife, Peggy. He greeted me in a tattered robe, grimacing in pain. He wanted me to propose a structural exposed ceiling for the family room that would have a beautiful view out of a large glass window. Sometime after the meeting, I called his office and found out that Bud was terminally ill, which explained his behavior on our visit. I worked for a couple of weeks until I had a concept that I thought he would like. I returned to his home, model in hand, and met Bud at the door. He had the same pained face, tattered robe and a handful of pills. I presented my model, which he held up to the light to see inside. For the first time, a big smile came across his face. He said, “I knew you could do it!” That brought a tear to my eye — it still does when I tell this story. Bud knew he would never see the house, but he was designing it for Peggy. Peggy did build the house with the exposed structure roof. I hope she loved the house as much as Bud loved designing it for her, and I was honored to be a part of his design team. There are many great architects in Dallas and growing, as Dallas becomes more of a design center. I don’t want to name them as I will leave someone out. But great architecture is coming out of Dallas every day, which is a pleasant change from 50 years ago. Thomas, you are admired and respected for how you utilize craft to incorporate structural elements that enhance the design and often improve the budget and outcomes of major projects. Please give us a few examples. Dallas Convention Center: While we were designing the last addition to the Dallas Convention Center [now the Kay Bailey Hutchison Convention Center], the city submitted a proposal to bring the Olympics to Dallas. They wanted to make the convention center a 425-foot clear span space to facilitate indoor sports competitions. As structural engineers, we took the initiative to conceive two relatively economical and attractive arches above the roof in order to hang the roof from the arches. When we lost the Olympic bid before construction on the addition had begun, I asked the city if they would like to return to the original structural system that had columns at about 150-foot spans. The answer was “absolutely not.” They loved the clear span space and already had conventioneers interested in this proposed column-free space. That was a structural solution that was economical, structurally sound, and architecturally pleasing. EDS Corporate Headquarters, Plano, TX: Occasionally one of the most economic solutions in structural engineering can also produce the best design. The concept for the new EDS headquarters building in Plano was an eight-story building that had the top three floors spanning 180 feet over the main entry drive that went under the center of the building. This is a significant span for maintaining a vibration-free and deflection-free floor system. We took the initiative to create sufficient documentation to obtain cost estimates for 11 concepts to span the distance. The most economical scheme was our proposal of steel catenaries that went across the 180-foot span over the roadway. HKS and EDS preferred this concept from a design perspective, even though it was the least expensive of concepts. This value-engineering exercise paid off as a win-win solution that everyone liked and it was the most economical, which I have found to be an unusual combination. One Atlantic Center, Atlanta, GA: This is a 50-story office building in Atlanta, GA, that was completed ahead of schedule in less than 24 months. At the time, most high-rise building structures in the city were done with concrete, but we felt we could use a unique combination of a steel floor and a cast in place of a concrete core. We had been working with slip-form concrete cores where the form is only 4 feet tall. The form is continuously hydraulically raised at a floor a day instead of typical forms that are raised floor to floor every three days or so. The concrete core was topped out in 56 days at 710 feet and over 50 stories. The surrounding steel followed seven floors behind and was welded to steel plates cast in the concrete core. At the start of the project, the 5 o'clock news had a reporter on the corner asking everyone if they knew what was occurring at the construction site. No one knew. The news helicopter showed the increased height each day. The reporters returned to the corner after 20 stories had gone up in 20 days and asked those passing by what the construction process was. Everyone answered, “Oh, that is a slip-form core.” They had seen the discussion and the daily news reports. At the time of construction, this was the only slip-form core in Atlanta and was the tallest slip-form core in the country. Dallas Police Memorial: The architects deserve full credit for the design concept of this memorial, but it took a lot of engineering effort and an eye for what they were attempting to accomplish. The 10-foot-wide roof cantilevers 40 feet, and the overall thickness is about 16 inches. All of the columns are on one side of the canopy instead of the center, which caused a major twist in the columns. Additionally, the design of the canopy was twisted in relation to the base or foundation, which made each column at a different angle from the others. The architects wanted the columns to slope parallel to the canopy. The columns were to be clad in a thin stainless steel sleeve. This proposed concept didn’t feel like a pure structural appearance to me, and we had to deal with high stresses in the columns due to the specifications I have mentioned. Because of this, I used 7-inch solid-stock stainless steel, which I found to be relatively common in the petrochemical industry. In spite of all of our carefully done calculations, I realized we couldn’t control the tolerances of the steel mill, the fabricator, and the erector, so I was concerned about the end of the cantilever sagging more than calculated. To cover our bases, I installed a post-tensioning cable down the middle of a steel box beam supported on the stainless steel columns in order to adjust the deflection. The actual deflection was three-quarters of an inch, which was not noticeable to the eye. But since I had the post-tensioning cables installed, I post-tensioned the box beam until the end of the cantilever was perfectly level. At the dedication ceremony, the police chief recognized this engineering feat to a rewarding applause. It was a moving dedication service, and I sat next to the son and grandson of Officer J.D. Tippit, who was killed by Lee Harvey Oswald following the Kennedy assassination. The project was so important to honor our fallen police officers and was probably the most emotional project with which I have been involved. What advice would you give to architects to maximize teamwork and collaboration with the structural engineers on projects? Bring us in early. There are many great structural engineers in Dallas who appreciate architecture, and give them the chance to contribute to your vision. That has to happen early in the process. How has technology changed structural engineering since you started your career? The change has been immense, from a slide rule to high-powered computers and amazing software. Dane and I have been married seven years after my first wife and Dane’s friend died of cancer. We live in a home Lake|Flato designed with Mary Ellen Cowan of MESA Landscape Architects for us. We love it so much — we spend many hours enjoying the house and the grounds. Dane loves all the architects she has met and is always ready to go to the next Dallas Architecture Forum presentation. My daughter, Lauren, goes to the University of Montana in Missoula, studying wildlife and land conservation. My son, Scott, lives here in Dallas, and he manages the historic buildings we restored on Main Street of Dallas and in Missoula. You have been, and still are, involved in civic and community leadership in Dallas. Do you have a couple of interesting stories from these areas of leadership? I don’t view myself as a leader, but I appreciate the thought. I think the most rewarding experience was developing Stone Street Gardens on Main Street in 1999. Main Street and Stone Street were in pretty bad shape and scary to some people. I had an idea to buy the building along Stone Street, renovate it, open up sidewalk cafes, and attract office workers and the meager number of people living downtown to come to Stone Street. I felt that bringing life to downtown would transform the undesirable activities that were presently occurring. This was a big success. Neiman Marcus inducted me into its Hall of Renaissance Men for this accomplishment, and the city asked me to do the same thing at Pegasus Plaza, where I built the building that houses Iron Cactus. Now Headington has taken this block of Main Street to a level I never anticipated could happen — The Joule Hotel, Forty Five Ten department store, and Traffic LA department store. They asked me at the Renaissance Man ceremony, “If downtown could speak, what would it say?” My response was, “I'm back, I’m beautiful, and you gotta love me.” I don’t know where I got that quote, but Headington has made it real. They are so very generous to credit me with being the pioneer. My first six years on the DART board was tough. But my greatest accomplishment is my lasting friendship with Adlene Harrison and the subway under Central Expressway. Structural engineering and historic preservation. I didn’t renovate it, but I own a building in Missoula that is on the National Register of Historic Places. I’ve also received three Dallas Preservation Awards. What books or articles have you ready recently that you find interesting? I primarily read focused on engineering and architecture. I am now reading a book on Leonardo da Vinci by Walter Isaacson and The Structure of Design by my all-time favorite structural engineer, Les Robertson. Its main strength is the DFW International Airport. But I think the large amount of land we have available and the close proximity of Dallas and Fort Worth, as well as all the suburban communities, create an intriguing strength. I would have to yield to the city planners to answer this one more definitely for me. A little more city and regional planning would help unify the growth of the area. But I would also yield to the city planners to amplify on this one. Favorite cities, buildings, landscape/public space — what do you like about them? Favorite cities are Paris and Florence for totally different reasons. Paris is a great people city, but Florence seems to have retained its history better. I haven’t traveled much lately, but I think Sundance Square and Klyde Warren Park will hold their own as far as public spaces go. My favorite building is still Bank of China by I.M. Pei and Les Robertson. But there are so many great buildings being built today, this is hard to answer. Which styles of architecture have influenced you the most? I really like buildings with a lot of cables, curved surfaces and unique shapes. But I think I have been influenced by straighter, clean-line buildings. I like everything the architect client likes and want to contribute to its success regardless of the style. Style is not my choice to make. My choice is to accomplish the architect’s goal. When I work with a new architect, I read as much as I can about them so I can do the best I can to contribute to their vision. Which guests, living or deceased, would you like to invite for dinner and discussion? My grandfather, W.G. Taylor, who let us live in a nice home he owned until I got out of college, along with Frank Welch, O’Neil Ford, Winston Churchill, and FDR. My wife and I like people. We like being around people, so we attend more events than I can list. We are far more interested in hearing their story than telling ours.